Summer always seems so short, and it's important not to waste any precious warm-weather moments searching for bars, restaurants or getaways. The guys who created Immaculate Infatuation's Guide To Killing It This Summer are here to help. Their beautiful 65-page multi-touch book is the ultimate summer accessory for any New Yorker. 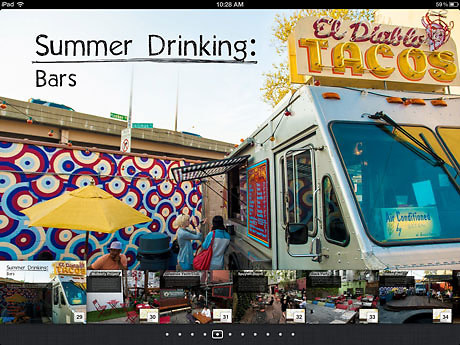 The book, which can be downloaded to your iPad or downloaded as a PDF, features photographs and short write-ups about some of the city's newest restaurants, beer gardens, and destinations. The book is broken in 8 chapters, and in electronic form readers can easily flip from "Wines To Drink When It's Warm Out" to "Summer Restaurants: Gardens, Patios, and Outdoor Eating." With Memorial Day weekend just one day away, this guide is a must-have for NYC this summer. Click HERE to download it on your iPad for free!